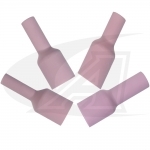 TIG/GTAW, HeliArc, or HeliWeld gas nozzles (also called gas cups) are available in a three types of materials; Alumina Oxide (pink), Lava (light brown ceramic) and Glass (pyrex and quartz). 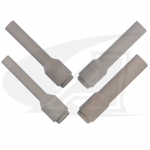 TIG nozzles come in a wide variety of shapes and sizes depending on your torch and your welding application. 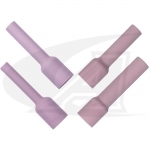 The gas outlet or "orifice" of a TIG gas nozzle is measured in 1/16” (1.6mm) increments. 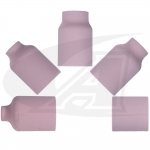 For example if your gas cup is marked with a #4, that means it's a 1/4”, (6.4mm) or 4/16” in diameter. The gas nozzle orifice is located at the end farthest from the torch body. 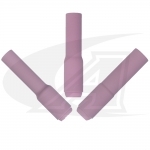 Orifice sizes range from; #3 = 3/16” (4.8mm) used for Micro TIG torches, to the largest, a whopping #18 = 1-1/8” (28.5mm) diameter for ultimate shield gas coverage (part of the CK Gas Saver series). 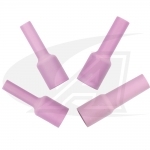 Alumina Oxide (pink) gas nozzles are the most popular TIG cups. 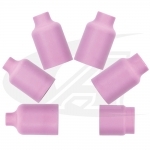 They are made from high-temperature shock-resistant alumina oxide that is injection molded and when fired they turn pink in color. 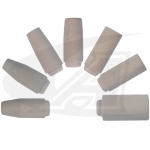 90% of all welding applications use alumina cups. 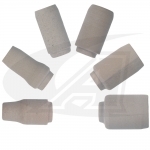 Lava (light brown ceramic) gas nozzles are made from a clay material which is machined to size then fired like pottery to give them strength. 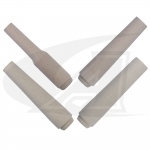 Lava gas cups are used for high-reflective heat applications, and where a special shape nozzle is needed. 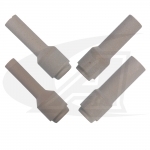 Lava nozzles can be machined to a variety of shapes and sizes without the expensive injection mold tooling involved with alumina cups. 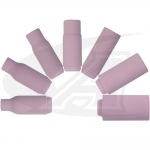 Glass or Pyrex gas nozzles are used for highly-specialized TIG welding applications on micro TIG torches, and the CK Gas Saver kits. 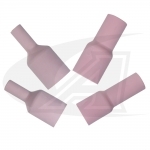 Glass nozzles offer improved visibility, and the quartz nozzles are extremely temperature resistant. 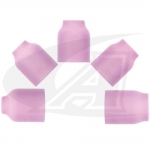 Glass nozzles can not be threaded, so you must use special push-on, o-ring design or similar means to hold them in place. This can be an issue if you need the nozzle to hold a bracket such as with a head-mount cold wire feed assembly.